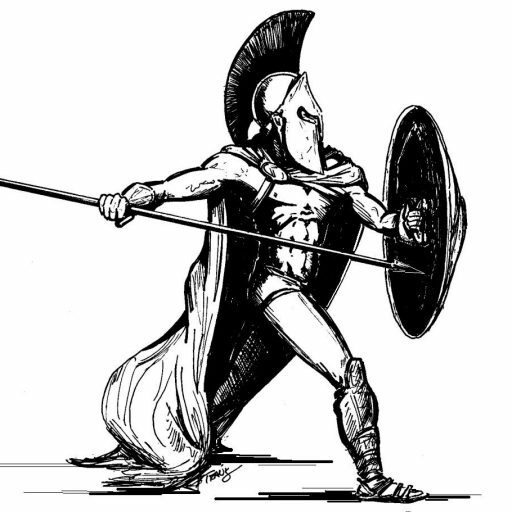 January 9-12 marked Spirit Week for Christ Covenant School. Due to the first snow of the year, Monday (Casual vs. Formal Day) was excluded from the Spirit Week schedule. 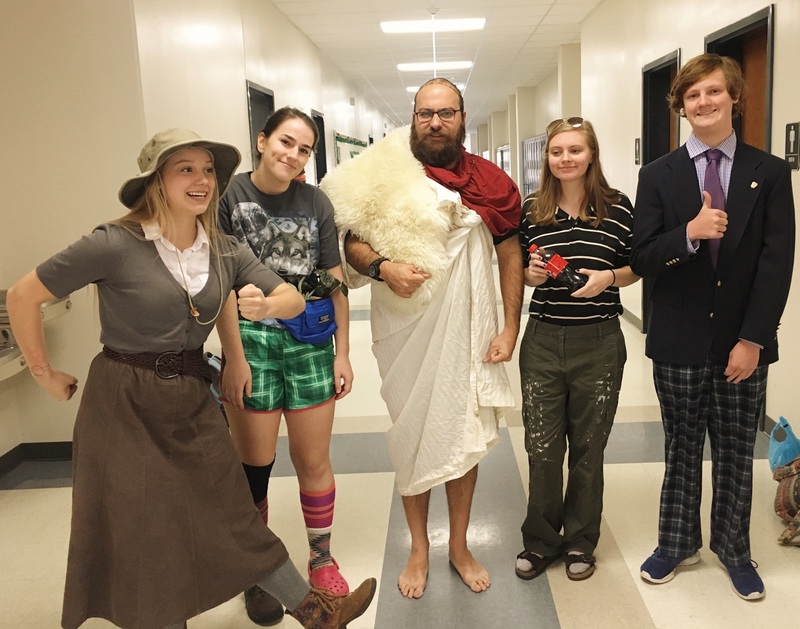 However, the students still enjoyed Teacher Day, Wacky Tacky Day, Decade Day, and Spirit Day. Tuesday brought a great deal of laughter in the minutes before first period. Infinity scarves, Coke bottles, and gym whistles accompanied many of the students in to class to represent a teacher. Look-alikes of upper school math teacher Evan Beyer were the most prevalent, donning loose curls or tight buns, cardigans, and the iconic infinity scarf. Wednesday brought insane updos, ponchos with strange prints, and lots of crazy, mismatching socks together to make a live pool of vibrant color in the hall. Every day, each class sent their best-dressed student to be judged by the Prefect Council; the top three students would win points for their class. Wacky Tacky Day was, by far, the hardest day to evaluate for the Prefect Council. On Thursday, the school held a pep rally in a middle school match against Ridgecroft. Students of all grades came to sit in the stands, their grades identifiable by their Decade Day dress, and cheer for their friends and classmates. Decade Day brought back attire from the 1860s and continued all the way to the predicted clothing of 3000. All in all, the students enjoyed taking a break from the dress code and showing their individual and class spirit at school. The week concluded with a tie for first place between the 9th and 12th grades, 11th in second place, and 10th in third. 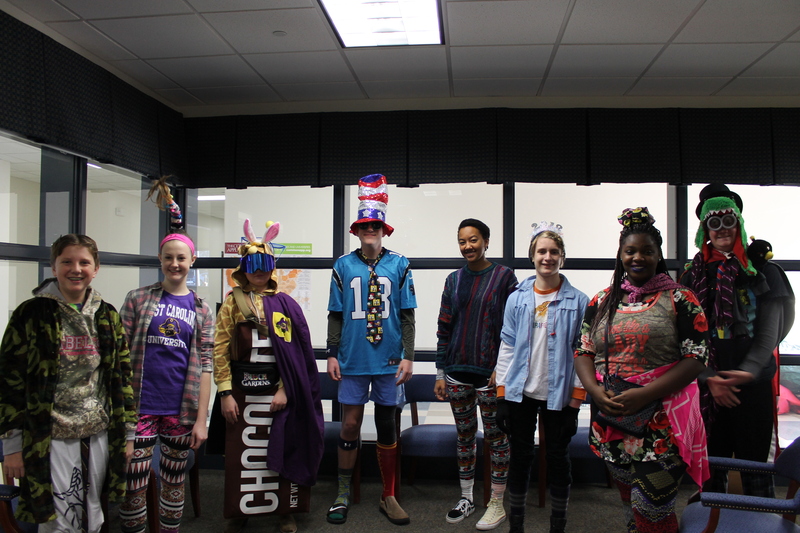 The winners for Wacky Tacky Wednesday pose in the office before the Prefect Council ranks the top three candidates. 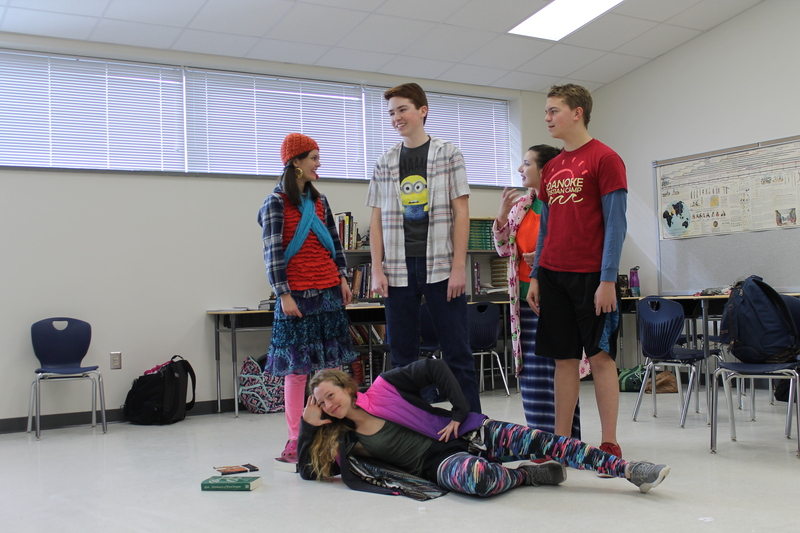 Tenth grader Natalie Draper, ninth grader Tucker Winslow, and twelfth graders William Snowden and Bethany Lee rest in their blocked positions at rehearsal for The Music Man during Wacky Tacky Day. The Prefect Council represented all of the Spirit Week days at chapel on January 3. 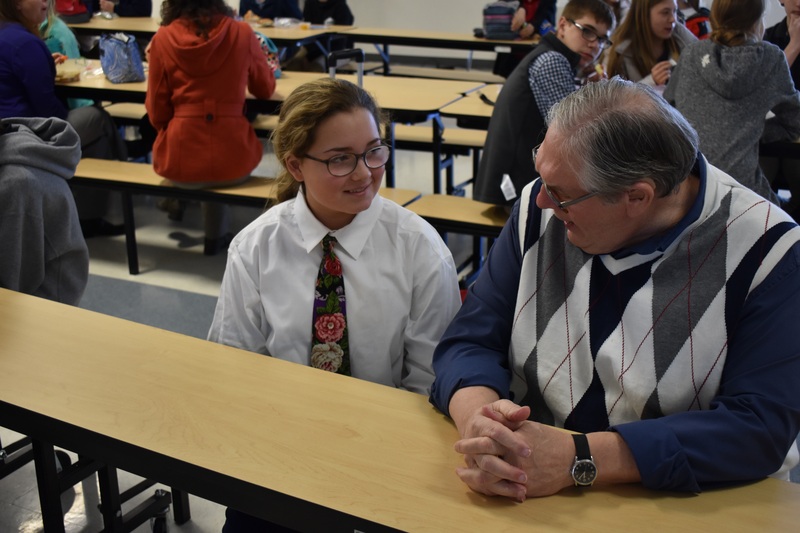 Ninth grader Laci Thomas, dressed as upper school teacher Jon Alder, chats with her look-alike at lunch on Teacher Day. 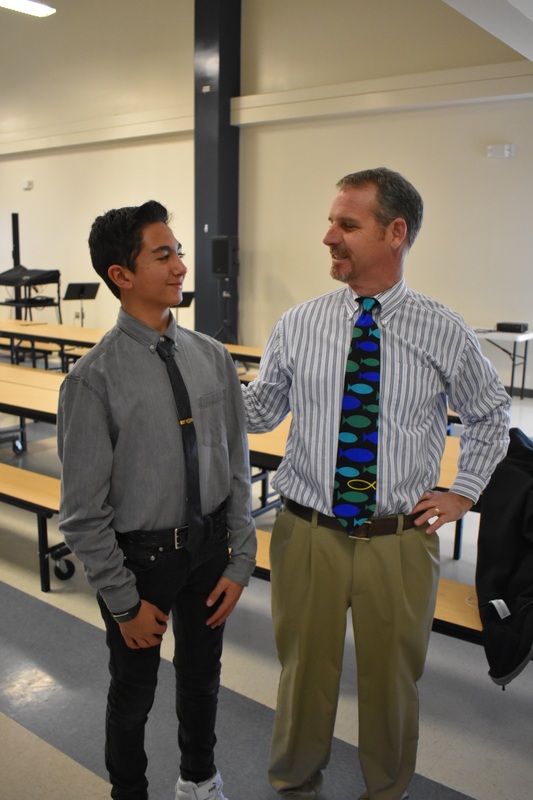 Seventh grader Vandad Shojaei poses with his look alike, headmaster Robert Lee, on Teacher Day during lunch. 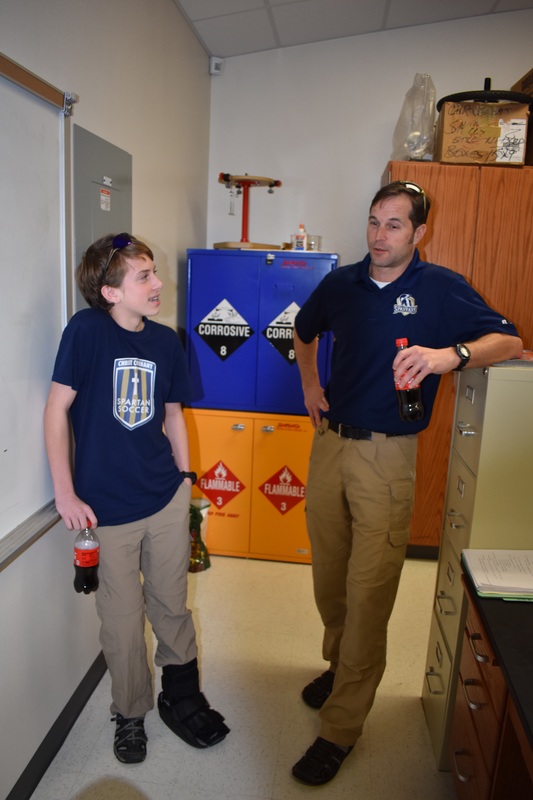 Ninth grader William Sutton and upper school teacher Chris Mitchell discuss Sutton’s first place costume on Teacher Day.